A stunning number of American children are subjected to at least one Child Protective Services investigation by the time they reach 18 years old. According to a study published by the American Journal of Public Health, almost 4 out of every 10 American children will experience some kind of social worker investigation into allegations of child abuse or maltreatment at some point in their childhood. The rate is even higher for African American children (53.0%). Alarm bells should be sounding for every family in America. According to the 2010 Census, there are 74.2 million children under 18 in the United States. 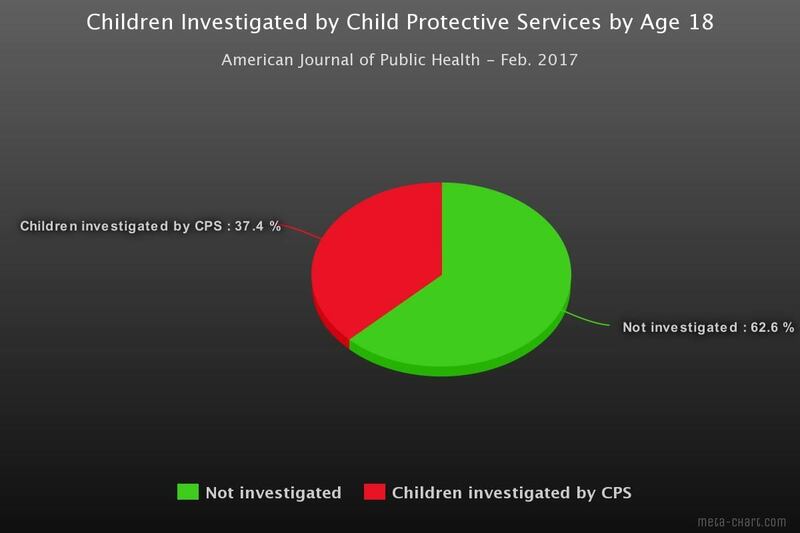 If 37.4% of American children will be investigated by Child Protective Services, at some point, by the time they turn 18, that means that the strong arm of the law, via social workers, is investigating almost 28 million children. Odds are strong that your children or your sister's or best friend's children will be investigated. Will the social worker be one who believes that they are justified in lying about you? Will the allegations be made up? Will they be from a doctor that the court will believe over you, no matter how much evidence to the contrary you have? Do you have the money to hire an attorney to help you fight? Will your newborn be deprived of vital bonding time and breastfeeding? Will your child be abused or trafficked in foster care while you fight in court? Will you lose family and friends in the face of accusations of things you never did? Yours could be the next family investigated. Chances are almost 40% that you will be investigated one day. Isn't is time to pay attention?